Eliza has an adventure watching the dragonfly change from a mucky nymph to a beautiful, winged creature. Whimsical, rich illustrations. Emily and her mother look to find a very special butterfly at the 4th of July Butterfly Count, held on the grounds of Emily’s great-great-grandparents' farm in a prairie area. 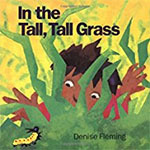 Fleming, writer and illustrator of over 20 children’s books, winner of Caldecott award. A prairie story. Published in 1995, this book is a classic. It is very expensive in hardcover, but can be purchased cheaply from resellers. Information and activities, presented in rhyme and song. 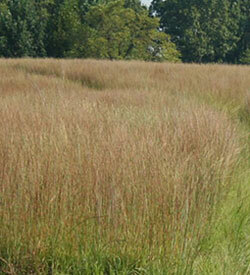 Saturday, August 11th, 10 – 11:30 a.m.
Join Richard as you explore Crane’s Gove Creek at the Oakdale Nature Preserve. Midwestern streams have an interesting natural history from several perspectives, including biology and geology. This exploration will take place at a couple of locations along the stream and you will be wading in water where the opportunity is good. Meet at the main parking area of Oakdale. If you have any questions about the event, call Richard Benning at 815-865-5279. If you would like to apply for a scholarship for educational opportunities such as courses, programs, and workshops related to our mission, you can find an application form at the monthly meetings near the display section or email nwilaudubon@gmail.com. This bird moves its long black bill back and forth through a pile of leaves like a broom sweeping the floor in a kind of “thrashing” motion. Leaves scatter in the air as the bird pokes into the soil and finds a small beetle to eat or maybe some other small insect. Male and female brown thrashers look alike. Their heads, bodies and tails are a rich, brownish, rust color. Their bellies are white with black, teardrop-shaped markings. These birds have long legs, bright yellow eyes and bills that are long and straight. 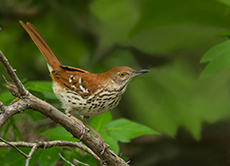 Brown thrashers are aggressive birds, fiercely protective of their nests and territories. But they are also SUPERSTAR singers! The male brown thrasher can sing more songs than any other North American bird! They have a playlist of “bird itunes” of over 1,100 songs! They eat small insects, fruit and nuts. They find their food by swinging or “thrashing” their bills back and forth to sweep through leaves and probe the dirt. Brown thrashers might even come to your backyard if you offer food. They may pick up fallen seed off the ground beneath your feeder. You can attract them by planting shrubs that produce berries. * Sources include www.kids.nationalgeographic.com and www.allaboutbirds.org. Observe in your own backyard  or anywhere. Use a magnifying glass to observe closely all the interesting bugs. What are their colors? How do they protect themselves? Where do they live? Collect rocks and paint them  a time-honored and very popular kid activity. 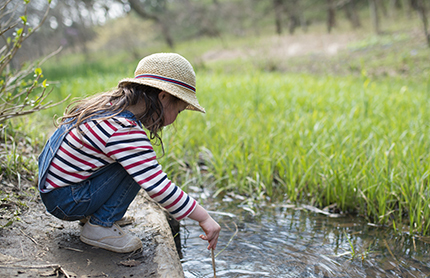 Find the flowers and plants you want to use  but not from the neighbors’ yards or nature preserves! Remove the flower blossoms and leaves from their stems and lay them on construction paper. You may want to practice arranging the flowers. For each placemat you want to make, cut two pieces of contact paper, approximately 9x12". Peel the backing off one piece of contact and lay it sticky side up on the table. 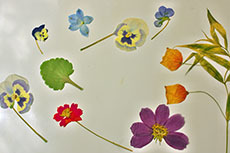 Arrange the flowers and leaves so they lie flat on the contact paper. If you’d like to add more decoration, press ribbon to the edges of the border. Flatten your placemat once more to smooth out any wrinkles or air bubbles, and use scissors to trim the uneven edges. Trace the circle for your wreath by drawing around the large pot or bowl on the cardboard. Cut out the circle. Then, using the smaller pot or bowl, trace another circle inside the one you just made. Carefully cut around the smaller circle you just drew. Now you have the pattern for your wreath. If you’d like, color or paint the wreath before you add your summer mementos. Using the scissors, poke a small hole in the top of the wreath. Thread several inches of the string or yarn through the hole, tie the ends in a knot, and slide the strings so that the knot is hidden under the wreath. This is the hanger. Dust a layer of sand over the glue so that the entire wreath is covered. Let the wreath dry for about 10 minutes and then gently shake off any sand that hasn’t stuck to the glue. Decide where you want to place your summer mementos and glue each of them to the wreath. Let the wreath dry and hang it up to remember your summer fun.